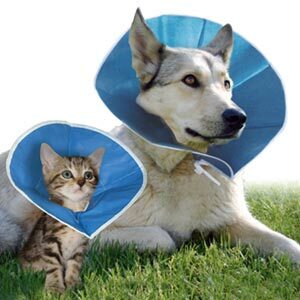 The Trimline Recovery Collar is a soft, flexible and lightweight alternative to the traditional old-fashioned hard cone Elizabethan dog collar and lampshade style Buster collar. Say goodbye to uncomfortable, inconvenient, hard plastic Buster and Elizabethan dog collars. 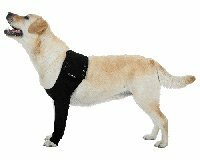 The Trimline Recovery Collar is a soft and comfortable pet, animal and dog recovery collar that effectively provides a barrier to the treatment area while still allowing the animal to eat, drink and sleep in comfort. 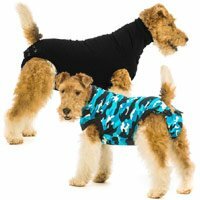 These medical collars are soft, flexible and lightweight yet will always spring back into its original shape. - Effectively provides barrier to treatment area. 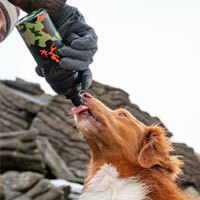 - Allows the animal to eat, drink and sleep in comfort. 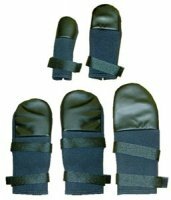 - Allows freedom of movement of head, neck and body. - Eliminates annoyance of hard plastic collars. - Soft, flexible and lightweight. - Easily applied drawstring design. - Non allergenic, non toxic, water resistant. - Always springs back into its original Elizabethan dog collar shape. - Withstands chewing and clawing. - Flat fold design saves storage space. 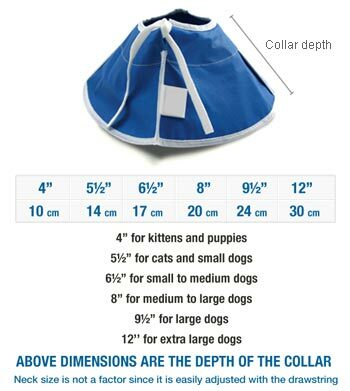 Measure your dog's head from behind the ears to the nose and then select the appropriate Trimline Recovery Collar depth. 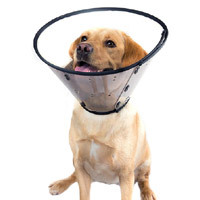 After so long looking for an alternative collar to ‘The cone of shame’ I finally found the perfect alternative. My rough collie has a long nose and was able to lick and chew her legs with other alternative collars I bought. Thank goodness for Trimline recovery collar, it’s long enough that she cannot get to her legs at all and at long last her legs are now getting much better, it broke the lick itch lick cycle. Thank you dfordog. Customer service I found excellent. I have used these collars before and found them to be very good - however my Deerhound wasn’t impressed and overnight it was in shreds on the kitchen floor !! That will not put me off from stating “Yes I would use them again but not on him” I feel that they are so much kinder to the animal than the rigid plastic ones - never mind human legs as well as furniture !! My Labrador had eyelid surgery this soft recovery collar protected her eye from being rubbed and from her pawing it. After a week it lost its shape and tended to turn inside out whilst being worn, but by that time her wound had healed. Overall a good short term solution. Excellent collar for my cat. More comfortable than the hard collar and she was able to eat with the soft collar on. This product is so much better than the cone given by vet. Our puppy was so much happier with the soft cone. Bought this for my cairn terrier who had an poorly eye and was finding the plastic cones far to heavy. He was a lot happier wearing this as it was slightly smaller and a lot lighter than the plastic vets ones. I then used it on my pug who had a hip operation and he also was better for using it , he slept much better as it bends a bit, although he did manage to flip it in side out so he looked like a choir boy !!!!! It was soft and comfortable for our dog. Did what it was supposed to do. What more do you expect. Partially successful. My lab puppy was 12 weeks old when he had an abdominal operation. The collar was good in that it did not stress him at all and did keep him off his stitches to begin with. As the days went on the puppy had worked out how to get it out of the way and wasn't strong enough after about 7 days. Would recommend it for dogs that don't chew or aren't too inquisitive. This cone was better in terms of ease to take on and off compared to the hard cone, but the dark colour made vision poorer. Hence the 3 star review.